Having come across negative websites which pour misinformation, cynical lies and slander against me and Russian YACONTO companies, I made a decision to open www.yaconto.ru in 2008 and present true and documentally supported information about YACONTO companies to the International community. I was particularly outraged by outright lies forged by the author of the article "Expansion of exteriors" posted on 28.10.2007 on www.tuapse.ru. It was not a problem to identify this cynical "exemplar" in the age of scientific and technical progress. In order to give out misinformation for truth, it is posted on different websites of the web, created for this particular reason only. Those provocative websites also publish other libelous articles and information of similar nature. There will come a time of justified, inescapable retribution, when cynical "adventure seekers" on their blatantly provocative websites will be held responsible by Law - in courts, with all appropriate administrative, material and criminal responsibility, to the fullest extent - for lies and slander which dealt damage to me as Russian Citizen and Proprietor of YACONTO LLC. Understanding that "custom disinformation" in mass media can ultimately lead to total liability, author of the article "Expansion of the exteriors" dated 28.10.2007 , under the nickname "Nik" continues posting his pre-paid lampoon in the internet - under the same title, but another, deliberately changed date of 14.04.2011, and under another nickname - "Sergey Pupkin". Their goal was to continue disinformation against Russian YACONTO companies and question the veracity of the content of 4 (four) published articles about the "tuapse bug" prepared by YACONTO LLC and published on www.yaconto.ru in Spring 2010, and consecutively on the current website in 2012 - for the international community and public. Information about the "tuapse bug" has been, in particular, set forth in the Statement from YACONTO LLC to the Minister of the Interior of RF Rashid Nurgaliyev (out. №100726-1 of 26.07.2010) which suggested coming back to the meticulous investigation of the premeditated bankruptcy of Atommash OJSC in the interests of the State, and informed about other facts of unlawful activity which require an inspection by law enforcement agencies. A formal come-off of the Volgodonsk police of Rostov region of 13.12.2010 to YACONTO LLC prompted us to send a Complaint to the Chairman of the Russian Investigative Committee Alexander Bastrykin (out. №110124-A01 of 24.01.2011) and a Complaint to the General Prosecutor of RF Yuri Chaika (out. №110201-A01 of 01.02.2011) with 2 Addendums, as well as a Statement to the General Prosecutor (out. №110418-A01 of 18.04.2011) with 3 Addendums. 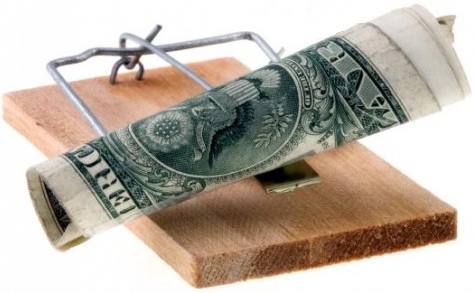 For all years of my activity as an independent businessman from 1988 in the Soviet Union and then in Russia, I came across many adventurers, fraudsters, swindlers and other "actors" from quasi-business who, positioning themselves as Russian and foreign "investors with bags of money" tried to become my "business partners". I have seen enough of this "public" of all kinds and trades. One of such "business partners with billions of pseudo-investments" was an Autonomous non-profit organization: The Institute of Strategy Researches "Ocean". More details about the activity of ANO ISR "Ocean" can be found in my article: False investor from the "Ocean" on the vast plains of Russia, first posted on 01.10.2009 on www.yaconto.ru and on this website. It's enough to take a look at documents and chronology of events in the said article to make a conclusion, for whose benefit ANO ISR "Ocean" carried out its "activity" and if the people behind it can be trusted. Their activity raises many questions and one should think twice before ordering their services. YACONTO LLC has also many questions to a Company called IC Inter Consult GmbH (Germany, Düsseldorf), which was closely connected with ANO ISR "Ocean" , which is supported by documents. Thus, it's no accident that several provocative websites continue publishing "pre-paid disinformation" about YACONTO LLC, positioning IC Inter Consult GmbH as a "keeper of morality and reputation in business". Since spring of 2010 I have patiently waited for those cynical "rustlers" from Düsseldorf to be reasonable. Although they crossed the line of ethical conduct in business, I did not take any action to stop their illegal activity against YACONTO LLC. But that gave no results. Therefore, I have all reasons to believe that the "fruitful" activity of IC Inter Consult GmbH will pose interest for law enforcement agencies of Russia, CIS and the West. It's no accident that on 11.02.2010 YACONTO LLC received a Letter from IC Inter Consult GmbH, which contained a demand to remove documents, mentioned in the article "False investor from the "Ocean" on the vast plains of Russia" from www.yaconto.ru. The "appeal" also implied that in the opposite case the Company will be forced to appeal to Russian Prosecutors. That made me suspect that the Letter from the commercial bank Credit Suisse AG, Deutschland to IC Inter Consult GmbH dated 31.03.2006 might actually be fake and the bank has nothing to do with it. In order to divert attention from the fake document, they decided to make fuss and slander around YACONTO LLC. For this, a company called SEA TRUST Ltd. forged a knowingly false Letter (out. 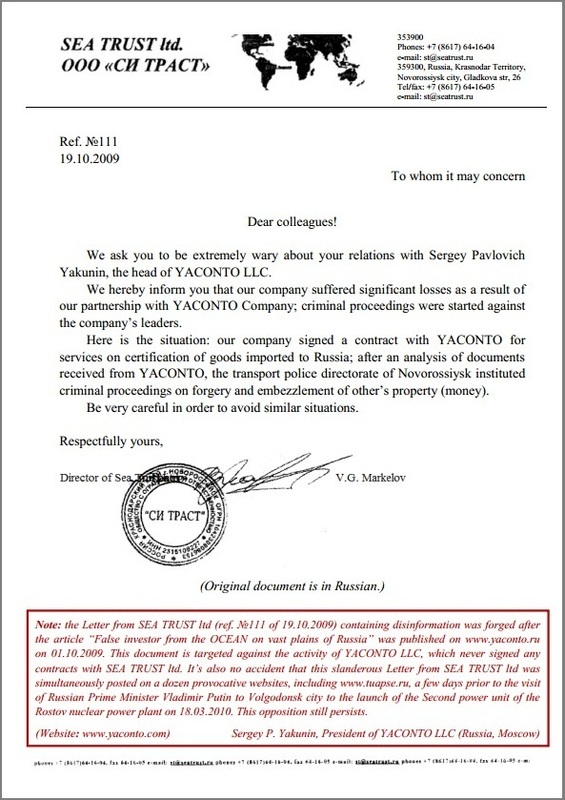 №111 of 19.10.2009), which implied that YACONTO LLC has, allegedly, dealt significant damage to the said company and, after an inspection, the transport police directorate of Novorossiysk has, ostensibly, instituted criminal proceedings on documents forgery and seizure of other's property (money). However, YACONTO LLC has never signed any contracts with SEA TRUST ltd. and has no idea where is it located and what it does. More details can be found in the "Tuapse bug" and other articles below. Deliberate disinformation about the activity of YACONTO LLC in the forged Letter from SEA TRUST Ltd (out. №111 of 19.10.2009) still continues to reflect the interests of people "around" the former Russian Minister of Defense Sergey Ivanov, currently the Head of Administration of the Russian President, who also used to be Deputy Prime Minister of RF; people "around" the former Deputy Chief of Administration of the Russian President Igor Sechin, currently President and Chairman of the Board of Oil Company Rosneft JSC, who also used to be Deputy Prime Minister of RF; people "around" the former Minister of the Interior Boris Gryzlov, currently Chairman of the Supervisory Board of State Corporation Rosatom and Chairman of the Supreme Council of the "United Russia" political party; people "around" the Advisor to the President of RF Igor Levitin, who used to be the Minister of Transport of RF, as well as those surrounding several other high-ranking officials, whose corporate interests are secured by numerous deputies, aides, advisors, consultants and other cynical corrupt officials, who rotate their positions and are hired from the ranks of false and hypocritical experts, careerists, sycophants, adventurers, rogues and traitors. During the entire period of Vladimir Putin's control over the State and the Government of RF, people from the "surroundings" of the aforementioned high-ranking officials did their best to prevent the implementation of the highly efficient nongovernmental investment YACONTO Integrated Program, which does not need any financial guarantees from the state at all - only a pivotal decision to support it from the administrative standpoint on the highest level of power. These very "surroundungs" continue opposing the thorough investigation of the premeditated bankruptcy and liquidation of Atommash OJSC, the Russian nuclear engineering flagship. Although the total amount of damage dealt to the Russian Ministry of Defense by OGIO and OCG members during Anatoly Serdyukov's term as the Minister of Defense appears to be significant, it is tiny compared to the huge damage dealt to the State by the bankruptcy of the industrial giant Atommash OJSC and the anti-state activity of corrupt officials from the "surroundings" of the said people. Those corrupt officials undermined economical security and defense of Russia; their actions can be classified as Treason and prosecuted with capital punishment, which is being efficiently used in China and not yet abolished in the U.S. More details about the activity of destructive forces and possible consequences of their actions for Russia are set forth in the reasoned appeals from YACONTO LLC to Vladimir Putin as Guarantor of Constitution of RF: the Statement (out. 120815-A01 of 15.08.2012), a Complaint (out. 120924-A01 of 24.09.2012) and a Statement (out. 121009-A01 of 09.10.2012), published on www.yaconto.com. At justified suggestions of potential foreign investors and strategic partners of YACONTO LLC, and in the interests of the International community, society and civilized business, and in order to expose the crimes of corrupt officials on federal and regional levels and their accomplices from Russian law enforcement, investigative, supervisory, controlling and judicial authorities who serve the interests of the "ruling elite" and their monopoly business partners, in spring 2012 we launched a website www.yaconto.com in English. On this website YACONTO LLC will publish documentally confirmed information about its activity, which is aimed at socio-ecomomical development of Russia with a reasonable participation of West on mutually beneficial terms. This website will also host information about the relentless struggle for restoration of my Rights as a Russian Citizen and Proprietor of YACONTO LLC, violated by state criminals and their abettors, and about the return of property, illegally seized with the help from uncontrolled corrupt officials who enjoy exorbitant authority in Russia. High-ranking officials and their accomplices have put themselves above the Russian Law by making their "immunity" serve their unlawful activity. The key reason for publishing materials on www.yaconto.com is the Western world's demand for exposure of streams of misinformation, initiated by an Organized group of interested officials (OGIO) and an Organized criminal group (OCG) around the activities of YACONTO LLC connected with the implementation of the promising multidisciplinary YACONTO International Program via Project-A for the restoration of the status quo of Russia's nuclear engineering flagship Atommash OJSC. Members of OGIO and OCG have been actively destroying Russian industry, agriculture and science, and continue doing so, thus undermining the country's defense, security and statehood. In order to accomplish that, corrupt officials, linked by "mutual protection", and their accomplices from law enforcement, supervisory and judiciary authorities, as well as special services, who act in the interests of the ruling elite and their monopoly business partners, using all means at their disposal, including mass media and internet to discredit YACONTO LLC through information warfare. Hence, only www.yaconto.ru and www.yaconto.com are YACONTO LLC's primary sources of official information. YACONTO LLC is currently preparing for series of events in mid-term perspective. Stay tuned to our website.